According to the US 12 Heritage Trail website, "Every year individuals clean out their attics and stake out their front yards along the US-12 corridor... You will find everything from antiques, collectibles, furniture, dishware, fresh garden produce, homemade jams and jellies, live entertainment and much more. Perhaps even more interesting than the “treasures” are the people you will meet along the way." Unlike some garage sale trails, the sellers on this trail may be located at homes, farms, businesses, parking lots, or fields. Marketed as "Americana at its best," the sales are really just a great reason to explore southwest Michigan's towns and byways. US Highway 12, which runs across Michigan from its eastern to western shores, is sometimes referred to as the Old Sauk Trail or the Chicago Road. The US 12 garage sale trail (Michigan's longest) is a tradition held annually since 2003; the event features more than 200 miles of garage sales. The Route: The trail runs 212 miles along US Highway 12 across Southwest Michigan from New Buffalo to Detroit. You'll find a detailed map online a few days prior to the sale. Dates and Times: The event is held annually during the second weekend of August, from Friday through Sunday. Opening and closing times vary by the seller but plan to start early each day. In 2018, sale dates are Friday, August 10 to Sunday, August 12, 2018. These tips will help you get the most out of your time on the trail. 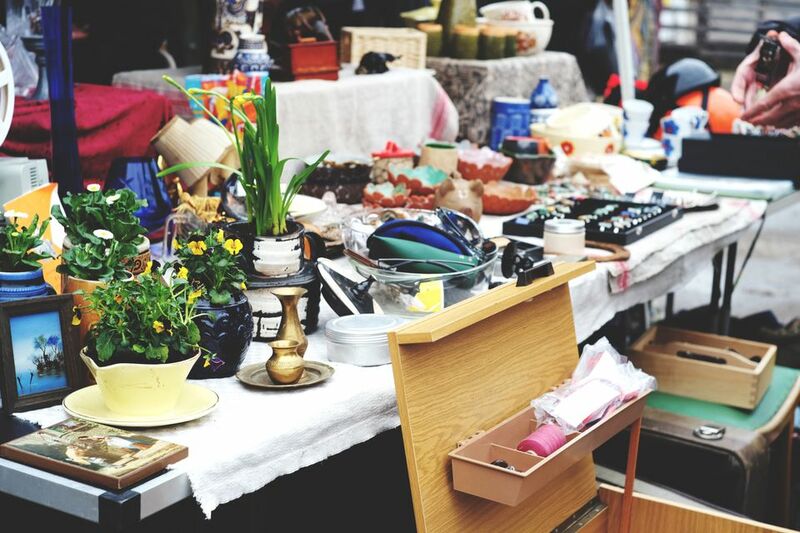 Remember that garage sales are about more than shopping: they're also a great way to connect with locals, explore America's byways, and practice your haggling skills. In addition to garage sales at private homes, watch for clustered sales in parking lots and fields. Expect to see everything from antiques to fresh produce, as well as tons of yard sale fare. Study yard sale shopping tips before you go, and then practice a few good haggling phrases out loud to yourself during the drive. As you drive through towns, watch for garage sale signs pointing the way to off-highway sales. The US 12 Heritage Trail publishes an interactive map on its site just before the event. Keep it pulled up on your smartphone or tablet so you don't miss any sales, especially the big group sales. If you live along US 12 (or even if you're just visiting), it's fun and lucrative to set up shop along the trail. You'll do best if you follow permitting laws and tips for increasing sales and managing your garage sale. If you want to sell and don't live in the area, booth and tent rental spaces are available in numerous locations along the route. If you plan to hold a garage sale during the event, check with your city or county to see if you're required to get a permit. Make sure to register your garage sale for inclusion on the event map. It's free and it helps shoppers find your sale.